Is that Zelda? No. No it’s not… Yes it is. Or not. 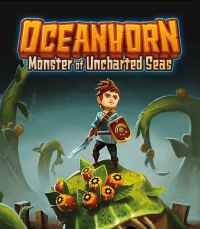 Originally released on mobile devices, Oceanhorn: Monster of Uncharted Seas is a game that looks to have drawn plenty of inspiration from The Legend of Zelda series, and while it may have trouble imitating the popular franchise’s charm, the newly released title on console and PC might be as close as it gets–which is a good try. 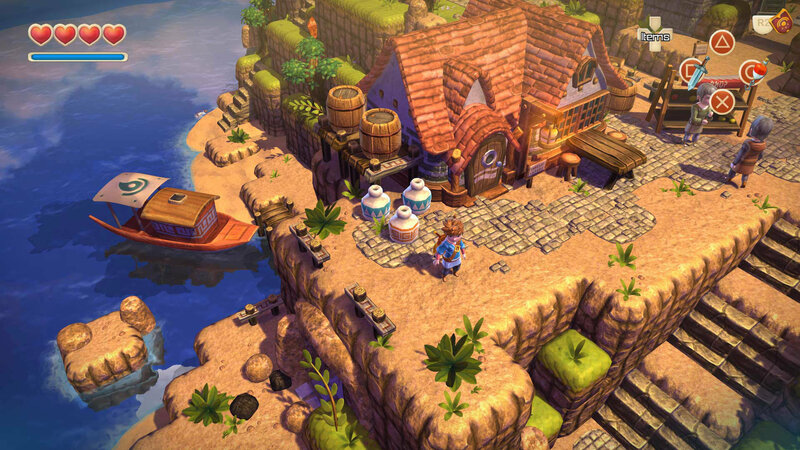 To say Oceanhorn puts players in familiar territory would be a massive understatement. The main character’s father goes on an adventure and disappears, leaving you with nothing but some equipment to get by. Luckily for our hero, the island’s elder nearby has some information for him to go on. And after a cutscene or two (with voice acting to boot), you begin a journey of your own, exploring dungeons with a sword in hand and a boat to travel with. Despite the obvious comparisons people will make with Zelda, in some ways, it definitely does feel different. For one thing, the game is in an isometric 3D view, so it’s a bit different from the top-down action had in A Link Between Worlds–although the character models do look eerily similar. Of course, not everybody likes the isometric view, and unfortunately there is no flexibility as far as freely moving the camera wherever you choose. The other thing Oceanhorn does differently is the fact that it doesn’t hold your hand nearly as much as the recent Zelda games do, which is the main reason why games like A Link Between Worlds and, its direct predecessor, A Link to the Past are widely regarded as two of the best. Instead, it uses its environmental surroundings as well as challenges to keep players invested in the journey. You know how to beat this boss? We’ll give you a hint; you have to make it swallow something it’ll regret. I’d say that most trouble gamers will have when playing Oceanhorn is with the possibility that Zelda will be engrained in their minds and muscle memory a little too much. If you’ve played as much Zelda as I have, you’ll be wary of portions of walls that look different because you can bomb them. You’re wary of the layout of certain plants because they might hide a secret passage. Maybe you notice strange loops on walls or branches, meaning you can use the hookshot on them later. These are things you grow increasingly paranoid of, but the fact of the matter is Oceanhorn isn’t quite as open-ended and as a result, it doesn’t leave much to the imagination. It just leaves you trekking forward from island to island, hoping to chart the uncharted seas in hopes of finding the titular beast in the end. While the game’s overall length clocks in at a solid 10 or so hours, the lack of any real twists makes the game feel one-dimensional. Each island has three optional challenges that you can do for trophies or accomplishments, but there really isn’t much of a point to them. At that, at least they give you goals to achieve, and some are actually quite fun. There’s one that’s as easy as killing an enemy with a jar, and there are some that are required like saving an inhabitant from a trap. There’s also a fetch quest towards the end that makes you go to every island you’ve been before, but unlike a game like Wind Waker which really showed differences with each island as you come back, it doesn’t happen with Oceanhorn. Lack of polish aside, Oceanhorn isn’t a bad game. 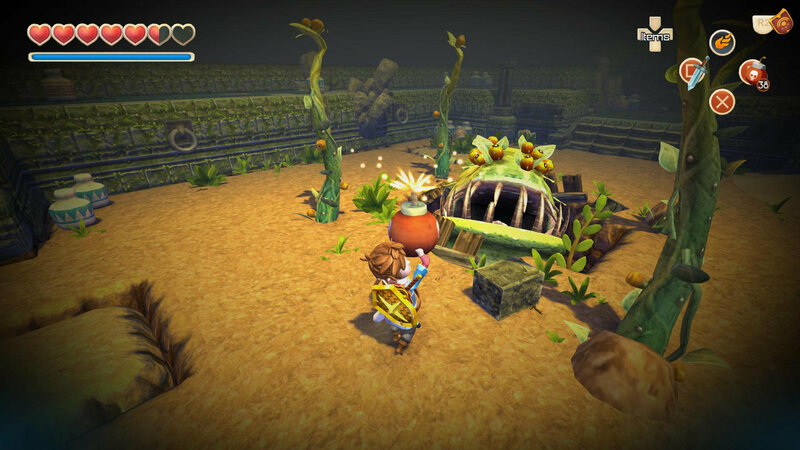 Sure, it has some rough edges and some annoying issues with its mechanics, primarily with sword swings not having the length you’d hope for as well as bad ledge-hopping, but much of what makes Oceanhorn seem unpolished is due to its unfair comparison with one of the great franchises in all of gaming. Of course, the developers obviously had their inspirations here, so it’s not necessarily supposed to be an excuse. And here we have a photo of a hero on a boat wondering whether his existence was inspired from something beloved. As far as positives go, the game is about as aesthetically pleasing as we’ve come to expect from top notch independent development teams, with lush and colorful visuals and a fantastic soundtrack. In fact, famed Final Fantasy composer Nobuo Uematsu, lended his melodic expertise to the game, and the whimsical soundtrack was probably the biggest thing that kept me playing. 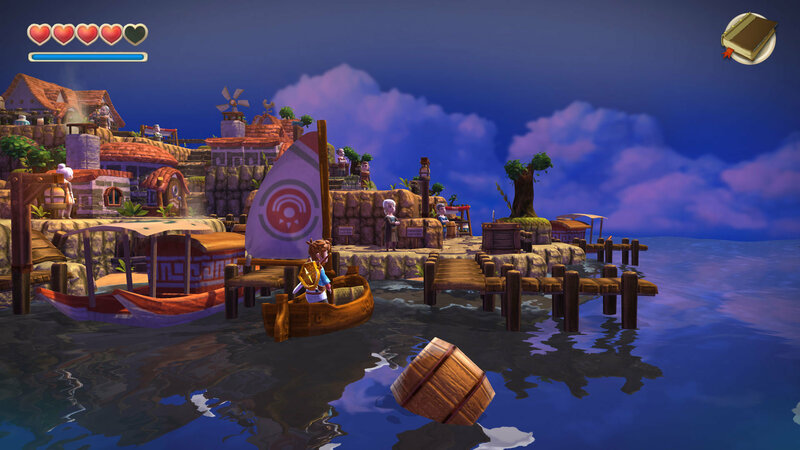 Oceanhorn: Monster of Uncharted Seas is nothing more or less than solid. With a sequel coming up soon, we hope the game is better suited for those playing on a console than this one was. We just can’t recommend this for the full $15.